Some readers will be aware I have discussed with Paul Connett, author of the book The Case against Fluoride, the possibility of some sort of “debate” between us on the fluoridation issue. We have now agreed to run a series of articles on this blog in a rough sort of debate format. I think most scientists are scathing about the gladiatorial style of debate – it is a sport and not a scientific exploration. It also encourages an adversarial approach, relying on personalities and oratorical skill and not evidence and reasoned consideration. Usually I call the bluff with such people – and they tend to disappear. But local conspiracy theorist Vinny Eastwood seems to have more influence in the anti-fluoride movement and when I accepted his challenge he did contact Paul Connett. So we ended up discussing possible places and formats for a “debate” during his visit to New Zealand next year. During our discussions Paul suggested that an internet debate might be a practical way of carrying it out. I agreed. The “debate”-discussion will be on this blog – Open Parachute. It will run as a series of pairs of articles – Paul Connett’s specific argument first with my response second. Posted the same day, or within a few days of each other. Each of us will respond to the other’s claims and rebuttals and to extra information (as well as any relevant input from commenters) by adding updates to the original article. Paul’s proposal is that the series include five pairs of articles – which seems like a convenient size for such an internet discussion. But let’s see how the cookie crumbles. As always, I encourage comments. However, both Paul and I feel that that comments in this discussion should be strongly moderated. Internet discussions are well-known for flame wars, personal abuse, harassment and offensive input. In my opinion the fluoridation debate seems to be very bad for such behaviour. So I have introduced comment moderation. Initially all commenters will find their first comment moderated. If this does not weed out trouble makers I will resort to moderation for all comments by specific offenders – or even moderation of all comments by everyone. It is important to keep this discussion civil and informative. Let’s be clear – this discussion is not about “winners” and “losers.” It is about discussion of the science. Hopefully this format will encourage good faith discussion and intelligent participation from commenters. The series of discussion exchanges starts tomorrow. 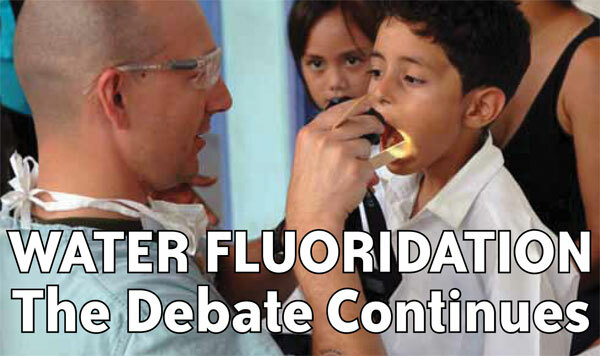 Anyone wanting to follow the debate and/or check back over previous articles in the denate can find the list of articles at Fluoride Debate. This entry was posted in Health and Medicine, SciBlogs, science, Science and Society and tagged Connett, debate, fluoridation, fluoride, Perrott, SciBlogs. Bookmark the permalink. Debate? You mean the pseudo-scientific objections to solid, verifiable, peer reviewed science and evidence. Hi Chris, to whom are you addressing your question? Ian, could you hold off with these sort of exchanges until the contributions by Paul and myyslef are posted. And then please direct the questiosn at the authors. We want to prevent these side skirmishes and will probably delete such comments in the future posts. I am sorry that our moderation is going to be that strict but both of us wnat to prevent the poor commenting that often follows such posts. Chris, could you repeat your question in the comments section under one of Paul’s contributions. He may not see it here. Thanks. Ken, that is not a certificate of analysis you post in your first response. It represents data said to come from a certificate of analysis. A CofA would be on the laboratory’s letterhead and signed. Can you explain the selenium level which is in <0.5g/100g or <5,000mg/kg or <5,000,000ug/kg. That works out at a truck load of selenium intake per day, especially for a kiddie being bottle fed. A 12 month RDI is 15 µg/day with an upper safe level of 60 µg/day. Does that concern you? Why is fluoride put into water? I’d like to see peer reviewed evidence that clearly illustrates how fluoride is effective in preveting decay if ingested after being dissolved in H2O. From my understanding, it’s only the topical application of fluoride that provides any protection. As for Se – come on, that is a diversion from the fluoride issue. But ponder on the symbol “<" and the fact that no one is feeding undisputed fluorosilicic acid to their bottle fed infant. Ok, so you have proven that fluoride is added to water so that it can be topically applied via swishing over the teeth while drinking water. That is not convincing at all. It still defies common sense, and is illogical. Why on earth would you consume a product that only works when applied topically if there is a risk of toxicity, especially for children? In Edmonton all you need to drink is two glasses of water to go beyond the acceptable limit for children. All of this to provide passive protection? I say we provide a free toothpaste program instead. 1) you can control the dosage 2) you are not forcing people to consume a product that they choose not to consume. I have spent a good amount of money to remove fluoride from our water at home. Those who cannot afford to do so are being forced to consume a known toxin, this is a shame and violates basic human rights. Take a grip, Core. There is no evidence to claim F a toxin at fluoridation concentrations. You are worrying yourself for nothing. Similarly, just because the predominate beneficial effect on existing teeth operates via a surface mechanism does not negate the beneficial role of ingested F in bones and pre-erupted teeth. The real world is a little more complicated than the picture you wish to promote. I’m afraid you may be mistaken Ken. For example, on toothpaste labels it clearly states that .73 MG of fluoride (SnF2) (a pea sized amount) should not be consumed by people under the age of 12. Are you aware that one glass of Edmonton’s drinking water contains .35MG of fluoride (H2SiF6). At these levels no child should consume more than 2 glasses of water. Why put our population at risk? I don’t think anyone can guarantee safety when the dosage is impossible to regulate. What if my child under 12 drinks 8 glasses a day as recommended? My child would have consumed a whopping 2.8Mg of fluoride. How as that safe? Again, get a grip, core? people are warned specifically to avoid consuming toothpaste. That sort of concentration does not apply to fluoridated drinking water. Don’t know anything about Edmonton’s drinking water (I am in NZ) but am sure it does not contain fluorosilicic acid which cannot exist at the dilutions of tap water – it decomposes on dilution. Could you provide data, or a link, on the official analyses of this water? It will be available. Why people think that ten minutes on the internet and a schoolboy calculation can reveal shocking safety revelations that every health authority on the planet has missed is beyond me. I’m not sure what you mean by get a grip, I’m completely at ease here. You seemed to have steered away from my point when you said “That sort of concentration does not apply to fluoridated drinking water”. According to my previous example, two glasses of water is enough to match the concentration of one pea sized amount. Why would I not be concerned? Especially for my children. Also, as a child of Edmonton, I personally have dental fluorosis on my front teeth and this has caused me my own share of embarrassment in social settings. This could have been avoided and I don’t want that for my kids. Can someone explain why people still advocate for fluoride? Why push for un-concentual mass medication of the population? Especially since it’s dosage cannot be safely controlled. There has to be a better way. Health authorities have been wrong before and the population is the one who pay the price. If you guys are so smart and want to stop the debate, why don’t you find a new revolutionary 100% safe method of delivery that doesn’t involve swallowing the product? I just got off the phone with EPCOR (our water supplier) and they confirmed that Edmonton is in fact putting 0.71mg of hydrofluoric acid in our water. On the website it just says “fluoride, dissolved” (http://www.epcor.com/water/reports-edmonton/Documents/wq-edmonton-august-2013.pdf). I asked for actual references and they said they will send me a link to the supplier. So, just like many “health authorities” I’m afraid you were incorrect in assuming that Edmonton does not put hydrofluoric acid in the water. Well, can you document that claim, Core? HF would be a silly chemical to use – it would not be practical or cost effective. Mind you, if it were used the end result would be the same – the hydrate fluoride anion. Are you sure you aren’t confusing HF with fluorosilicic acid? Core you are way, way behind. Suggest you read Ken’s articles to understand the chemistry involved. There is no hydrofluoric acid in your drinking water when it exits your taps. Ken, I will share the supplier when I acquire it; I’m awaiting a response in my email. As far as the rational, I can only report what I heard. The water technician said they use “fluorosilicic acid or hydrofluorosilicic acid”. He also said they buy from different distributors all the time, and it may depend on which distributor is offering the best deal at the time. He was going to dig up a packing slip and send me to the distributors website. I think that Core has also acknowledged his mistake – fluorosilicic acid (sometimes called hydrofluorosilicic acid) is used as I expected. The concentration of 0.71 refers to the concentration of the fluoride anion in the finished water – at the low end of normal fluoridation range. Regardless of the fact that Edmonton does put Hydrofluosilicic acid in it’s water, my original question still remains unanswered: “On toothpaste labels it clearly states that .73 MG of fluoride (SnF2) (a pea sized amount) should not be consumed by people under the age of 12. Are you aware that one glass of Edmonton’s drinking water contains .35mg of fluoride (H2SiF6). At these levels no child should consume more than 2 glasses of water (based on toothpaste warnings). Why put our population at risk? I don’t think anyone can guarantee safety when the dosage is impossible to regulate. What if my child under 12 drinks 8 glasses a day as recommended? My child would have consumed a whopping 2.8Mg of fluoride. How as that safe? Please explain so I can “catch up” to your science. Thanks kindly. Core – no one doubted that fluorosilicic acid would have been used as the fluoridating chemical in Edmonton – it is the most frequently used one. My point is that HF would not have been used as you claimed. But we have cleared that up. There are data provding dietary advice for intake of F and other elements – at the moment I can’t provde you with a link. But you should consult these and not take your advice off the back of a package. Particulary with the assumptions you make. There is general advice to limit a child’s consumption of toothpaste because of its high F and other chemical content. I used the toothpaste dosage as an example to make a point that it’s not that hard to “overdose” based on those guidelines. The example shows how it would only take a few glasses of Edmonton tap water for a child to exceed the “safe” limit as recommended by health authorities. With these points in mind, I still have yet to hear any conclusive responses from anyone on how to ensure our children do not get a higher dose than recommended. For these reasons, I think it’s safe to say that limiting exposure to “topical application only” is the only safe way to ensure a safe exposure to fluoride. Until someone can prove otherwise, we shall continue to pursue this opinion in all forums possible. Core, I think your examples shows the exact opposite. “Topical application only” – if it means using toothpaste – exposes children to the very risk you are talking about – consumption of toothpaste. However, one of the more effective ways the “topical” mechanism works is by drinking water regularly with sufficient F. This maintains the saliva and biofilm concentration required to limit mineralisation of teeth. Toothpaste helps but is not as regular. If you want to find the safe limits recommended by health authorities check out their publications, not the back of a toothpaste package. I appreciate your attempt, however with toothpaste at least you can control the dosage yourself, especially with proper technique and guidance. With water consumption you do not have a choice and cannot truly regulate the dosage, this is a problem. Also, when I research health authority publications for safety recommendations, many of them don’t have adequate information for children except this one from Harvard, which confirms my opinion to be cautious. The concentration of 0.71 refers to the concentration of the fluoride anion in the finished water – at the low end of normal fluoridation range.</I. Maybe but I don't know what Core is referring to. He compares stannous fluoride concentrations to fluorosilicic acid concentrations (calls both fluoride) and seems to believe fluorosilicic acid is being ingested by end user. Yes, the concentration of the fluoride anion in the finished water, that’s what I’m referring to. Excuse me if I don’t portray that clearly in my earlier statement. Either way, my point is that we can find evidence that indicates how children’s IQ and mental development were shown to be affected in areas with higher exposure to fluoride. Once again I will ask: Why are we advocating the use of fluoride if there is even a shred of evidence to support it could cause any harm? Is this all about helping homeless people have better teeth? What’s your motivation to defend fluoride? Whoa, hold up on the gish gallop Core. Roll back. Are you aware that one glass of Edmonton’s drinking water contains .35mg of fluoride (H2SiF6). That statement should have included “.35mg of fluoride sourced from (H2SiF6)” to be more accurate, for Richard.These are merely semantics, let’s get past it and how about answering a question about safe dosage for children? So far I have not heard anything remotely helpful from either of you. Instead I hear you both picking apart details of my posts and missing the point entirely. Why not state something helpful if indeed you are experts on the topic. Tell me how we can be sure we are not subjecting our children to excessive fluoride through drinking water? How can we control this dosage to be sure our children are not at risk for developmental issues caused by fluoridation of the water? What is your stance on the Harvard Study that shows children’s IQ are indeed affected by drinking water with higher levels of fluoride? Tell me something useful, please. Apologies, it was all our fault for assuming what you wrote is what you meant. OK, we’ve established no one was lying to you about treating water with fluorosilicic acid and that you are not ingesting fluorosilicic acid, in your drinking water. Question for you, is it sensible to compute maximum safe levels of fluoride in drinking water from information in the guidelines for SNF2 on the back of a toothpaste packet? – they could be lying to you just as easily as all the public heath authorities on the planet are lying to you. I just wanted to thank both Ken and Paul for having this debate. Correction, I never said anyone was lying to me, I pointed out that Ken was incorrect in his statement “but am sure it does not contain fluorosilicic acid which cannot exist at the dilutions of tap water”. Through my own due diligence I discovered “Hydrofluosilicic acid is used at both treatment Plants” in Edmonton (sourced from EPCOR). My main concern here is to understand how we can control the dosage of fluoride to our children, why is that so hard for anyone to answer? I also never said that the health authorities were lying to me, I merely implied they have been wrong in the past (happens all the time). If we are not 100% confident that we can deliver a safe dose of fluoride in the water – it should be removed. If you are going to reply, please reply with something that relates to controlling the dosage, especially for our children who are more at risk. That’s all I’m interested in. Thanks kindly. Core, you are mistaken to think my comment on the impossibility of fluorosilicic acid in your tap water was incorrect. The simple chemical fact is that fluorosilicic acid decomposes on dilution and cannot exist in the dilute and pH neutral tap water. Fluorosilicic acid is commonly used as a cheap and effective fluoridating chemical. But it’s effectiveness relies on the fact of its decomposition on dilution. What you get in your drinking way is the hydrated F anion, not the fluorosilicate one. If you don’t understand this simple fact you won’t be able to come to grips with all the misinformation on the Internet about fluoride. It is fundamental. No need for controlled dosage, that is one of the reasons supporting the efficacy of the delivery method, i.e. via public water supply. What is important is that ingestion does not exceed harmful levels. If you, or your child, set out to ingest enough fluoridated water to exceed minimum safe limits then the water will kill you well before the fluoride in it could kill or harm you. World wide public health authorities are not intent on hurting you. Translation: I found something on the internet. Health authorities have been wrong before and the population is the one who pay the price. Yes, “they” have been wrong before about other “stuff” at “some time” in the past. Therefore, they are wrong now. Those who cannot afford to do so are being forced to consume a known toxin, this is a shame and violates basic human rights. Yes, the health authorities are poisoning you and violating your human rights. The horror. ….especially for our children who are more at risk. I’m willing to bet that Core is a husband and a father of just an average family. You are all still dancing around the issues and doing what I expect typical debater, try to discredit someone for making statements instead of just answering questions directly. I’m aiming that statement at Cedric (who seems very immature unfortunately (you are quite assumptive and have no context for your comments.). And Cedric, I actually spoke to our water authorities on the phone and received a follow up email from them. As far as health authorities being wrong, did you read the Harvard studies above before posting? Plus, why would you post something about vaccinations? I think you are in the wrong forum or maybe you are the real crazy here. a) you still haven’t addressed the issue of safety for children directly. I’m not talking about a lethal dose (as implied above). I’m talking about the gradual effects that can be seen in the China studies (i.e. lowered IQ and well as dental fluorosis). If there was any harm detected, at all, don’t you think it would be safer to remove fluoride until you know that it is 100% safe….long term? What is fueling the fluoride requirement anyhow? Is it passionate dentists? Compassionate health authorities? Are we just following a pattern? How do you know our intelligence is not being diminished conclusively? What if our potential is a lot higher than what we truly have witnessed? How do you really know there isn’t an impact? The answer is you don’t, conclusively. And if you don’t know for sure (which I’m sure you will never admit) let’s take it out of the water and give a person the choice. Don’t force the public to consume a product that has demonstrated known issues, even at low levels of exposure. recent large-scale survey carried out in China (Chen et al., 1988), which showed that, with drinking-water containing 1 mg of fluoride per litre, dental fluorosis was detectable in 46% of the population examined. How can you say that the dosage is 100% safe in public drinking water if such a small dose can cause fluorosis? Please answer directly and try not to beat around the bush, thank you kindly. (who seems very immature unfortunately (you are quite assumptive and have no context for your comments.). And Cedric, I actually spoke to our water authorities on the phone and received a follow up email from them. As far as health authorities being wrong, did you read the Harvard studies above before posting? No. Was there some special reason why I should? Plus, why would you post something about vaccinations? Just switch the labels around from vaccines to fluoride. Cedric: Your comments prove that you actually have nothing useful to say here. Typical skeptic. Well core if you followed what Ken has written about the Chinese investigations in past comments,You would find that they have a major problem with high fluoride readings in drinking water, plus they burn fluoride heavy coal indoors for heating and cooking. The people also have high concentrations of heavy metals in there water in parts as well, So really you can be looking at fluoride levels of anything up to 150PPM. Only you realise, of course, that skepticism is a process-not a position, right? I don’t care what you believe. I only care about your methodology. That’s the thing that’s sorts out the sheep from the goats. If you are doing exactly the same thing as the anti-vaxxer nutters out there, then that should be a big, red flag for you. Chris. Firstly let me say THANK YOU, for being one of the few people here who has the ability to reply directly to a comment and not dance around the subject. For that I commend you (hopefully the others will follow). Ken: You were pretty helpful too, however I did experience a little bit of the “dance” from you as well. I can appreciate the fact that there are other factors involved in the Chinese studies, however in the World Health Organization document I posted earlier, the levels that presented visible signs of fluorosis were far lower than the 150ppm as you suggest. This concerns me, especially since children are more susceptible. And you mention that “slight fluorisis is just a cosmetic condition” like it doesn’t matter. Let me tell you, being afflicted with flurosis does matter and degraded my personal quality of life dramatically. It affected me my entire life and people always ask me “Why do you have those white spots on your teeth?” I embarrassingly have to answer, “It’s because of fluoride”. I never felt comfortable enough to smile as much as the rest, and this has a deep effect on the psyche. For that reason alone, fluroide should not be added to the water. I’m telling you that there should be ZERO side effects, ZERO health warnings, ZERO potential issues if you are going to MASS MEDICATE a population. I’m not concerned about natural levels of sodium fluoride, found in nature and foods (unless I am in an area of high risk). Why not? Because a person has a choice and can easily monitor their consumption while managing their own risk based on what they put in their mouth and on their body. With water, however, unless you are prepared with bottles and such, a person is always at the mercy of the chemicals added by the municipality. This is not a choice and it is encroaching on our freedom to have clean, pure water without unwanted additives. Another thing, science is always making new discoveries and often re-writing old “mistakes”. Recently, science is making new and important connections relating to early childhood development. We can see how even the smallest variances in diet, chemicals in blood, auditory stimulus, hormones, emotions of the parent during pregnancy, etc..all play into who the child becomes later in life. We are all a product of all of our previous experience and environmental exposure. If a person want to truly want to raise a child with the highest potential, they would minimize all unnecessary exposure to any chemical that could have any unwanted impact. It’s important to heir on the side of caution because you simply cannot turn back time on early childhood development. Science currently does not have all of the answers on the effects of fluoride on the developing fetus. If someone can prove to me how drinking fluoridated water is 100% safe I may convert. Until then, I will continue to heir on the side of caution. Thank you. I find it interesting that the same propaganda trolls that hover around climate change activist websites seem to gravitate towards the pro-F sites. I am sure it is nothing to do with a genuine concern for dental health. I guess I should have made it clearer who I regard as “propaganda trolls”. You can probably work it out for yourself. You are talking about yourself, right? No I am talking about you and Cedric. I am not the least bit interested in Fluoride. In our previous discussions about climate change, I provided links from the IPCC and all I got back was propaganda, i.e links to “consensus” pages. So, presumably, Richard, you have a deep seated concern for young children’s dental health? Or is it a pathological attraction to seeking out those with differing opinions and marginalising them as “nutjobs and wackos”? Andy, I suggest if you are not interested in fluoride you opt out of this discussion. We really haven’t got the space or time here for discussing the IPPC and climate change. And negative stereotyping of other commentors, the discussion process and this blog really only have the purpose of attemptiong to undemrine the current discussion. The key point being this discussion would be about the science. All the diversions into the psychology of advocates, confirmation bias, conspiracy theorists, what some particular advocate besides Connett may have claimed, etc., seem to me to show you have failed to fulfill your own intended goal with this discussion. While Dr. Connett has also succumbed to these non-science discussions, you have done so to a greater extent. I respectfully request you (and Dr. Connett) try to focus more on a scientific discussion. Otherwise, this discussion will not live up to its billing as a “scientific exploration”. I have extensively read the scientific literature on both the possible adverse effects of fluoride, and on caries prevention effectiveness. I share your policy of reading the entire papers, and give little credence to the minimal information supplied by abstracts alone. I am a skeptic. I do check to see whether references say what a paper claims they say, by reading the full referenced paper. Few people have the time to do this, even those who professionally offer their views on fluoridation. I have read Dr. Connett’s book, and he obviously has done extensive reading of the scientific literature, and almost everything he claims in his book he provides references for. Undoubtedly, Dr. Connett has biases … as you also must have, as I freely admit I have, as everyone, whether scientist or non-scientist has. The scientific method is intended to overcome such personal biases, and one of the main ways to accomplish this is through scientific debate. There have been some instances of good scientific debate here, that have helped bring out the strengths and weaknesses of scientific evidence. I would like more of that, and fewer distractions. I can get distractions many places, but genuine scientific debate of the safety and effectiveness of fluoridation is amazingly rare. Unfortunately “Follow” (I wish people wouldn’t hide behind slogans), none of your criticism are specific and therefore I can’t find any value in them. Could you be specific – examples where Paul and/or I have diverted “into the psychology of advocates, confirmation bias, conspiracy theorists, what some particular advocate besides Connett may have claimed, etc.”? Otherwise we have nothing to go on, can not correct our behaviour if required – or challenge you interpretation of events. I get the impression you are more concerned at appointing “winners and losers” than contributing to the discussion. Could you please identify your own interests in this? For example, do you by any chance have any association with the activist organisation Fluoride Alert? I hope you’re not one of those conspiracy theorists who think “Big Business” is paying off all the scientists in the world. You raised the topic of “confirmation bias” and expounded on it at length and repeatedly. That’s a specific example of a topic that adds little to a scientific debate about the safety and effectiveness of fluoridation. Ken: “Paul has asked me to limit my part of the exchange ‘to addressing my [Paul’s] arguments without going into the opinions and arguments of others, especially the more extreme views.’ I find that strange and am certainly not going to limit myself this way. I believe you misinterpreted Paul’s meaning. I don’t think he was asking you to only address his arguments, but to avoid getting side-tracked from what was supposed to be a scientific debate into trying to win “points” by bringing up examples of errors from some people on one side or the other, none of whom you or Paul has any control over. Ken: “I feel that opponents of fluoridation commonly rely more on confirmation bias than critical and objective assessment when referring to the scientific literature. Well, your comments hardly seem to lead the way to a “good faith discussion of the science”. Yes, Paul has also diverged from a debate of the science. I would argue he has been baited by you, but I’ll give a specific example of Paul getting away from a scientific debate. He raised the example of a Queensland Health 2007 promotional document that showed a mouth with beautiful teeth from a fluoridated community next to a mouth with atrocious teeth from a non-fluoridated community. Ken, you obviously bear no responsibility for this type of unscientific “argument” for fluoridation. I would be grateful if you and Paul would try to avoid these diversions as you continue your debate. To end on a more positive note, I did appreciate the discussion on the issue of systemic versus topical benefits, how to define topical, and the evidence that fluoridated water provides either. I believe this is an important issue, and one that a scientific debate can inform much better than a “political” debate. Thanks, Follow, for the specifics. Before I get into those (I need to check back to see their context) could you please answer my question? Specifically, do you have any affiliation with the activist organisation Fluoride Alert? I ask in the interests of a good faith approach to a discussion. And will deal with your specific points whether your answer is yes or no. As you may appreciate a commenter hiding behind a slogan does conflict with good faith. I just wish people would use their own names – there is no need to hide here. Having just come across your comments, with Ken’s responses, I too question your connections. Given your attempt here to limit the parameters of the debate as has Paul, I wonder whether you may be affiliated in some manner with Paul’s Fluoride Action Network, or with some other fluoridation opposing organization. Paul’s constant use of limited data from but a few studies out of the extensive volume of scientific literature on fluoridation, most certainly makes relevant the issue of “cherry-picking” and motivations. Too, given the extensive influence Paul has worldwide with fluoridation opponents with their often sole reliance on information they obtain from his “fluoridealert.org” website, it seems a bit disingenuous of him to attempt to distance himself from the extreme views which have, in all likelihood, originated in information from his website. To narrow this debate into simply a discussion of points he makes, most certainly would favor Paul’s attempts to base the entire fluoridation issue upon data from a narrow spectrum of studies, and divert attention away from the confirmation bias he demonstrates by focusing on a very few studies while ignoring the volumes of information to the contrary. In my opinion, it is important to keep things in proper perspective. Limiting discussion, limits perspective. I provide my full name with each of my comments and make no secret of who I am, what I do, or where I live, simply as a matter of full disclosure. Perhaps you might consider doing the same. I guess we can therefore all draw our own conclusion. I find this sort of deception disappointing. How can we have a discussion in good faith if people hide behind slogans? And why should you be afraid of revealing affiliations? I notice several other members of Paul’s Fluoride Alert “team” have contributed to the discussion and their presence is welcome. There is no need to hide. I just wish more of his New Zealand group would particpate – it think Mary is so far the only one. As for your claims – I have looked back and concluded your expressed concern really just comes from your bias. Both Paul and I have refered to issues like this and I think the context is always clear – we are not claiming the other is responsible for these transgressions. In no way are these occasional points going to torpedoe the discussion. We are all human, and consequently controversial topics like this will always contain ideological and political content – that is inevitable. There is no reason to pretend it doesnt occur. I think, with your likely affiliation, your comment was just a little bit of psychological warfare – to lay some sort of guilt on me. I have been getting that also from a number of local facebook groups. (Someone even wrote a poem about me – see https://www.facebook.com/FactsaboutFluoride/posts/543627022397819). As for your belief I interpreted Paul’s meaning about keeping discussion limited to his requirments – well you probably have better access to Paul than I do. However, in our intital discussion of possible debate format Paul was insistent that the discussion be focused on his book – I was insistent that I had my own message and information so I would not limit my contribution to his book. In the end, of course, one cannot make rules like that and we are both using our own information. My usual experience with people hiding behind slogans is that their comments end up, or maybe even start, as aggressive attacks. I have tried to capture such commenters by moderation and prevent their particpation unless they back off and start discussiong things properly. Let’s hope I don’t need to do that with you.